Indicating health problems of the past, present and the future. This iOS app can analyze your body and indicate health problems by showing organs and tissues that had some type of illness in the past, are ill now, or have a tendency to be ill in the future. 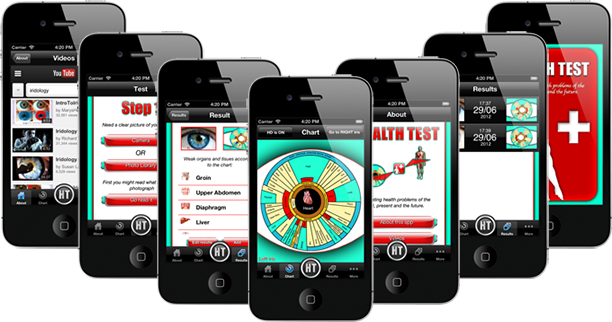 Test your and your friend’s health with this app, run a catalog, share it. Better health is not a science problem it's an information problem. We all know that the patient is the best doctor for himself and now it's up to you! Health Test can indicate your weak organs and tissues such as: heart, kidney, liver, pancreas, stomach areas, lung, throat, adrenal, prostate, bronchus, eyes, bladder, diaphragm, pelvis, pleura, thorax, groin, gullet, urinary, thyroid and the list goes on. Health Test results are automatically generated by doing a three-step process. After analyzing you can run a catalog of the results by date, view them in details and even share it. Eventually you can take actions in your life by doing further investigation with your doctor’s recommendation. This is how the app works: all you have to do is take a picture of your eye, zoom in to the iris, and mark the dark spots by drawing on the screen. Health Test will analyze the picture and list all the organs and tissues that are affected according to the iridology chart. How maybe this possible? Well, Egyptian, Chinese, Indian, Tibetan doctors and even the Nazis used this alternative medicine technique called iridology. And Health Test app is an automated iris diagnostics system that will match your iris photo to the iris chart, which divide the iris into zones that corresponds to specific parts of the human body. You wouldn't believe how much your eyes can tell about your health, it's all connected. Try and see it for your self! It's amazing when you can read your self from your eyes. 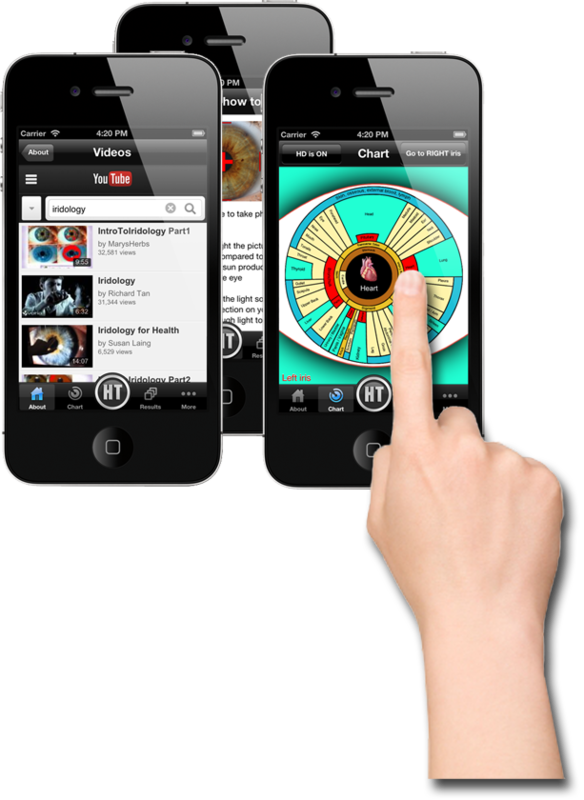 ©2013 Best App Dev for Cool, Intelligent Apps. All Rights Reserved.